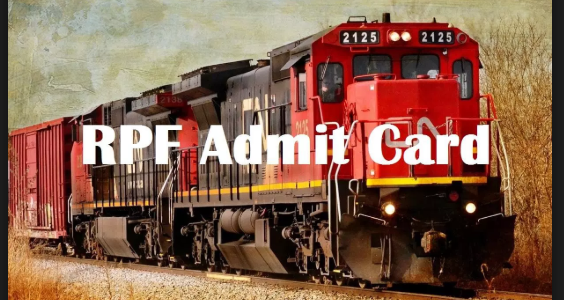 RPF Admit Card 2018/RPF Call Letter – Have you applied for RPF Recruitment 2018 and waiting for RPF Admit Card? The Ministry of Indian Railways has released the RPF hall ticket 2018 for SI and Constable on its official website – rpfonlinereg.co.in. The Railway Protection Force Admit Card will be issued only to those candidates who have successfully applied for RPF 2018. RPF Exam Date 2018 is announced to be starting from 19th December 2018. The candidates who have applied for the examination will receive the RPF Admit Card from 9th December 2018. RPF also announced that the Candidates will be communicated about the Roll Number through the E-Mail on the registered email ID by 16th November 2018. 12/02/2019 Latest Update: RPF SI Admit Card 2018 -19 for PET, PMT, DV for the selected candidates is available now. 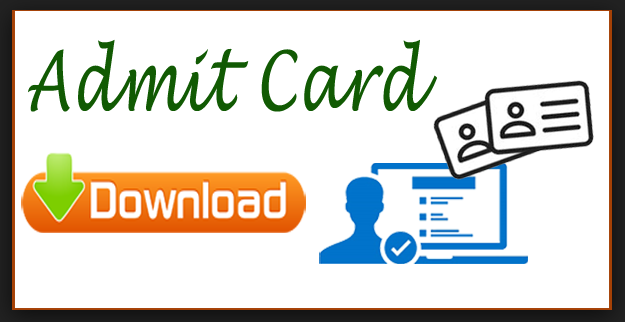 Download your Admit Card Here. 12/02/2019 Latest Update: RPF Constable Admit Card 2018 -19 for PET, PMT, DV for the selected candidates is available now. Download your Admit Card Here. 25/01/2019 Latest Update: RPF Constable Admit Card 2018 -19 for Group C, D has been released. Follow the link given below in table and download the RPF Admit Card for Constable 2018. Examination starting from 2nd February 2019 to 19th February 2019. 10/01/2019 Latest Update: RPF Constable Admit Card 2018 -19 for Group A, B, F has been released. Follow the link given below in table and download the RPF Admit Card for Constable 2018. Examination starting from 17th January 2019 to 22nd January 2019. 04/01/2019 Latest Update: RPF has declared that due to unresting issues in Kerala, the exams scheduled from 5th January to 10th January 2019 are postponed. Also, RPF has released links to recover Registration Number and Login Details. Latest Update 09/12/2018:– RPF has released RPF call letter for SI & Constable Posts. 23/11/2018 Latest Update: RPF Constable Exam Schedule Released on the official website. Check the link below. 21/11/2018 Latest Update: RPF has released the RPF SI Exam Schedule. The candidates can check it here. The RPF Hall Ticket will be available online for RPF Constable and Sub- Inspector Posts. Candidates will be able to download RPF Admit Card 2018 by entering their Registration Details. The RPF Hall Ticket 2018 serves as an Identity Proof for the candidates, as it contains all the personal details of the applicant and details about the examination. Carrying the RPF Exam Hall Ticket to the examination hall is mandatory. Candidates can check further details below regarding the Railway Police admit card 2018. Latest Update 16/11/2018: RPF Application Status and Roll Number released on the official website. Check the link to find the application status and roll number. Latest Update 15/11/2018: RPF Exam Date from 19th December 2018. RPF Admit Card available from 9th December 2018. RPF Exam Roll Number to be communicated through Email to candidates from 15th November 2018. 4 How To Download RPF Admit Card 2018? 6 What if RPF Admit Card has discrepancies? It is expected that the Railway Protection Force Recruitment Exam will be conducted from 19th December 2018. The Admit Card of RPF 2018 will be issued to the candidates from 9th December 2018 (10 days before exam). Candidates will be able to download their RPF Admit Card till the date of the examination, but candidates are advised to Download RPF Hall Ticket beforehand to avoid any technical or circumstantial issues. RPF Group A Admit Card – SR, SWR, SCR comes under Group A.
RPF Group B Admit Card – CR, WR, WCR, SECR comes under Group B.
RPF Group C Admit Card – ER, ECR, SER, E Coastal R comes under Group C.
RPF Group D Admit Card – NR, NWR, NCR, NER comes under Group D.
RPF Group E Admit Card – NFR comes under Group E.
RPF Group F Admit Card – RPSF Male candidates only category comes under Group F.
RPF Hall Ticket 2018 for Constable will be available 10 days before the date of the examination on its official website that is on 9th December 2018. There will be separate RPF Call Letter for different events, means there will be a separate admit card for CBT, PET and PMT, and Document Verification. it is expected that the RPF Admit Card for CBT will be released in November 2018. Candidates who will qualify the CBT will be eligible to download the RPF hall ticket for PET/PMT. The RPF e-Call Letter Download Link will be updated on its Official once released. How To Download RPF Admit Card 2018? Select the Criteria that you have filled – Constable/ Sub-Inspector. In the Download Page, enter details – Registration Number and Password. The RPF e-Call Letter will be displayed on the screen. Download and take the printout of the Railway RPF Admit Card. Candidates must take the print out of the Admit Card in an A4 Size Paper in colored format. The details and the photograph must be printed clearly. Candidates are advised to download RPF Hall Ticket before the date of the examination, to avoid technical issues. Space for Candidates and Invigilator Signature. Candidates must note that this RPF Admit Card is for the CBT Exam 2018 of Railway Protection Force. If the applicant qualifies this CBT Stage, then he/ she will be eligible for the next round. What if RPF Admit Card has discrepancies? Candidates must carry the following documents to the examination along with the RPF e-Call Letter. One Color Photograph (the one you had uploaded in the Application Form). The Finger should not be coated with anything such as Ink, Mehandi etc. Notify the concerned authority if the Right Thumb is injured or damaged. These are the following list of the instructions that is prescribed by the Railway Recruitment Board. Candidates will be notified on their registered mobile number/e-mail id regarding the Recruitment Examination. 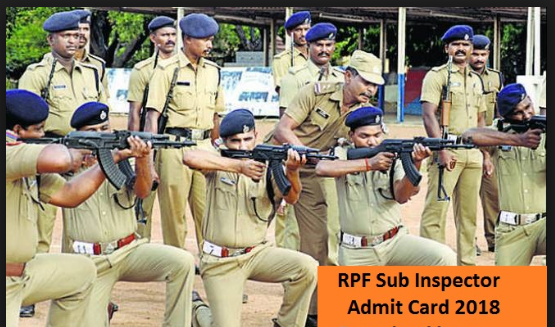 The RPF Admit card will be available online only. Carry a valid photo identity proof and photograph. Do not fill in the signature space. This has to be done in front of the Invigilator. No Electronic Gadgets are allowed in the Examination Hall. Following are the list of the details that have to be followed by the SC/ST Candidates. If the applicant belonging to the SC/ST Category has uploaded his/her caste certificate, then he/she will get a free travel pass in Sleeper Class. The Free Travel Authority Pass will be available along with the Admit Card. You are advised to carry your Caste Certificate during the travel. Railway Department will release the RPF Admit Card (e-call letter) 10 days before the commencement of the Examination. The RPF Exam Admit Card 2018 will be available online on the official website – rpfonlinereg.co.in. You will be able to download the Call Letter for RPF SI / Constable by entering the Registration ID and Password. If I lost my photo that I put in exam form than what should I do…? Get a recent photo put the date of the photograph taken and signature. Kindly click on the recovery link for the Registration Number. 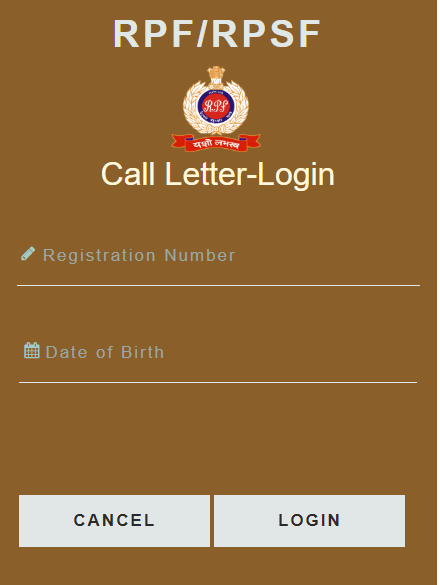 Recover you Registration Number and Password and log in to download the RPF Admit Card. Please follow the link to download only of the respective Group Admit Card. Check the RPF SI Exam Dates here. 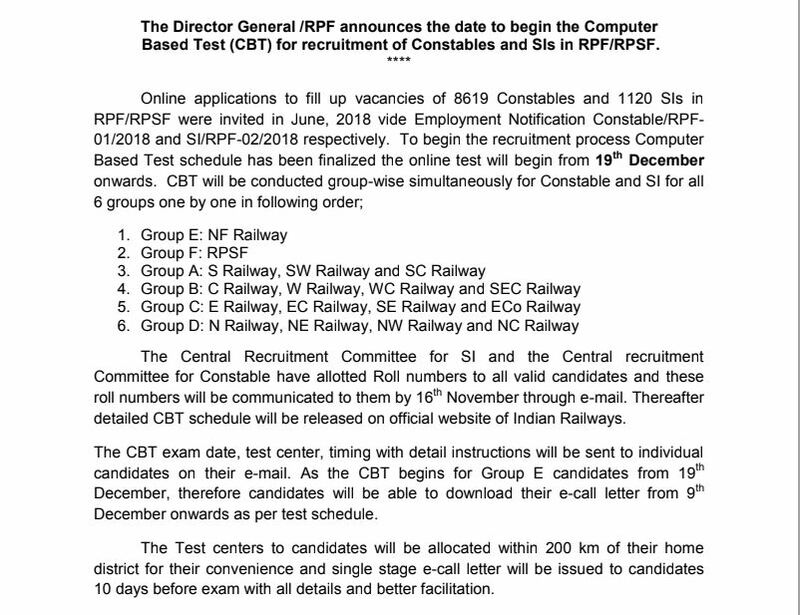 RPF Constable Exam Dates here. Your, Examination was indeed conducted on 17th December 2018. There may have been a probable miscommunication. If you have not given the examination, please try in the next recruitment. Āpanāra, parīkṣāṭi prakr̥tapakṣē 17 ḍisēmbāra 2018-ē anuṣṭhita haẏēchila. Sambhabata ēkaṭi sambhābya dūrnīti hatē pārē. Āpani yadi parīkṣāẏa nā thākēna tabē parabartī niẏōgē cēṣṭā karuna. is the rpf admit card will release on same date of all zones? Check the RPF Exam Schedule. The attached link tells the exact date of each Group examination. As far as Group C is concerned, RPF SI Group C Exam is on 9th January 2019 so the Admit Card will release on 30th December 2018. RPF Constable Group C Exam is on 2nd February 2019 so the admit card will release on 22nd January 2019. Sir, admit card ka notification email pe ya sms pe ajayega kya? Admit card ki notification mere number 9855523419 pe bhejj dijiye. Bookmark the article and keep visiting as soon as the RPF Admit Card is released we will update the link to download. please help me i lost my registration number.How i know my registration number again. There is no link on the official website to recover the lost Login Details Kindly put the query on the official website and proceed. For Group A The exam centers will be in the regions that fall under the Particular group only exact place and center address will be communicated via RPF Admit Card only. Check the given link of RPF Zonal Regions.for the city names that fall under your Group. Group A Regions are Southern Railways, Southern Western Railways, and Southern Central Railways. The RPF Admit Card has not yet released. It’s going to release on 9th December 2018. Kindly wait till the time being. RPF Admit Card SI post k liye 9th December 2018 ko release hoga. Aap article ko bookmark kr lijiye. Link active hote hi download kijiyega. Abhi aap, RPF Application Status or ROll Number check kr skte hain. Sir, roll number download kaise krna hai? Mera to download nahi ho rha please help. Roll Number download nahin ho skta. RPF Application Status me agar apka Application Valid hai, to RPF Roll Number bhi mention hoga. Aap Roll Number ko kahin likh kr save kr skte hn. Ya fir page ka Print le lijiye. When I can download my RPF SI admit card? Hi Pappu, the RPF Admit card will soon be releasing on the official website from 9th December 2018. We will update you with the recent notifications. Bookmark the page for the most recent updates. RPF Admit Card, 9 december 2018 ko ajayega. Link hum yahan update krenge. Aap login ID k through download kr skte hn. I am sorry that there is no way to recover the Registration Number for the RPF Exam. If you have the Printed copy of your Application Form, Registration Number would be written on it. If not, Then there is nothing that we can help you with. In the near future, if any kind of link or provision is made available to recover the Login details, we will urgently reply you back.